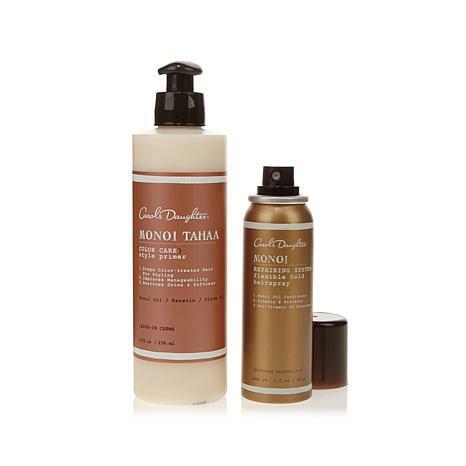 This set contains the Monoi Tahaa Style Primer and the travel-size Monoi Repairing Hairspray. The multi-tasking primer helps protect and condition dry, color-treated hair, while the micro-diffuser spray offers a clean, shiny finish with a long-lasting, touchable hold. Use after cleansing hair and before styling. 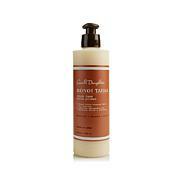 Apply a quarter-size amount into palms of hands and work through wet hair, applying it evenly from roots to tips. Depending on hair length and thickness, apply more primer as needed. Use a wide-tooth comb or your fingers to detangle small sections, one at a time. Apply more as needed to help add shine and prep for hair styling. Hold the canister 10" to 12" away from your hair and spray. Use before or after blow drying hair or after using a heat styling tool. Spray additional product after styling to hold your hair in place. To restyle, simply brush out. When using hairspray, avoid fire, flame and smoking during use and until hair is thoroughly dry. Use only is a well ventilated area. Avoid spraying in eyes. Contents under pressure. Do not puncture or incinerate. Do not store at temperatures above 120 degrees Fahrenheit (49 degrees Celsius). After styling, keep hair away from open flame or any flame source. Keep out of reach of children. Use only as directed. Intentional misuse by deliberately concentrating and inhaling the contents can be harmful or fatal. I learned quickly not to use a lot of the primer. It does make hair very soft and healthy looking. Also diminishes frizz. Use too much and hair looks greasy and limp. Hairspray is ok, but as personal preference, I prefer a stronger hold. I have natural curly very long hair not ever colored. This is the best tamer of frizz leaving hair defined in beautiful curls. I am a 66 year old strawberry blond. Buy it you wont be sorry. After washing with the monoi shampoo, I apply a pea size of the primer to wet hair.I let my hair dry natually,and just run my fingers thru it. It's so full and soft. Wish it was on auto/delivery. Like the primer it doesn't weigh the hair down, nice. Love the hair spray, goes on with a nice flow so it doesn't leave the hair crispy, nice fragrance. Please get he hair spray in a large size. I bought this on a whim, upon my first application i used a dime size, my hair was stiff and tacky and I was sure I was returning it. But since I had 30 days i thought I would work with it, well I have fine, thin, limp, gray 65 year old shoulder length hair. I started using a pea size and boy what a difference that made. My hair seems fuller, softer and looks extremely healthy and I also apply the miracle serum and my hair looks like a younger version of me. I suppose the lesson here is you only need small amounts of Carol's Daughter products because they are superior quality and concentrated.